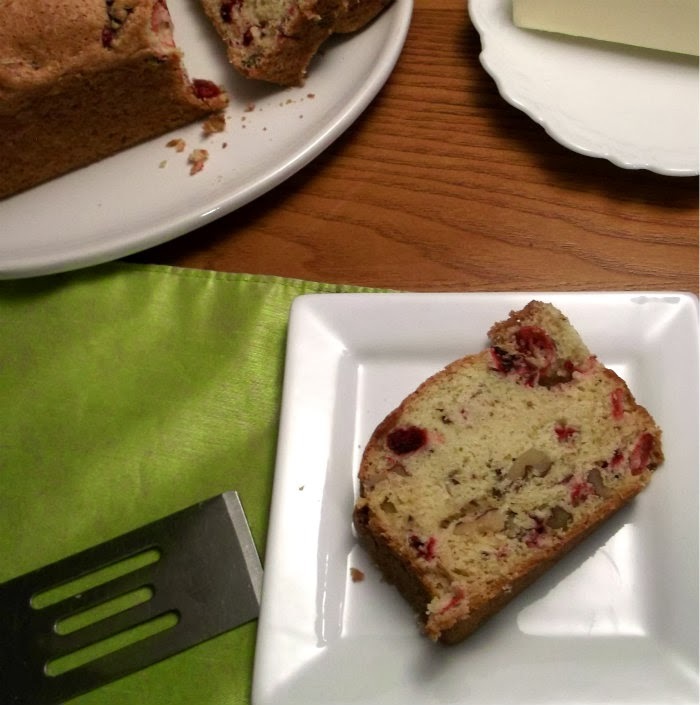 Cranberries are not just for sauce… that is so true … they are wonderful in baked goods too. I cannot believe it; this is the first time I am baking with fresh cranberries. My only real experience has been with the cranberries that come out of a can or cranberry juice. How sad? 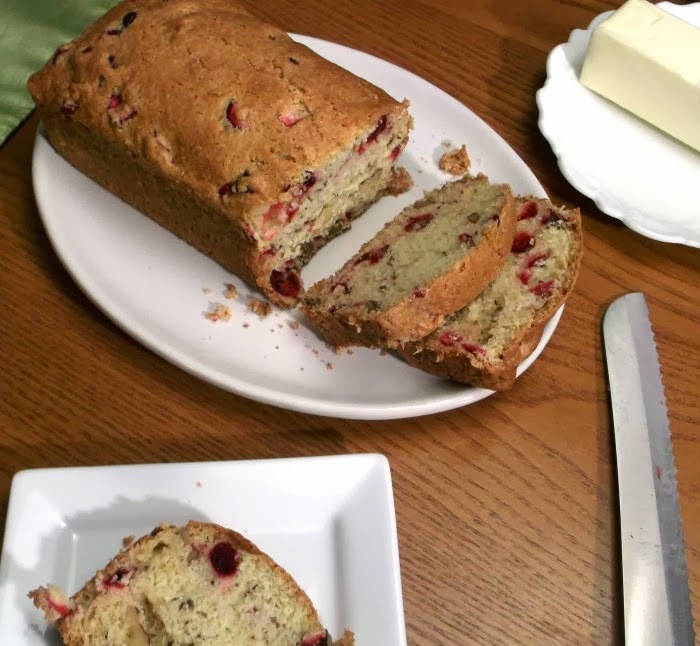 After making this cranberry nut bread I know that I have been missing out, big time. For some reason when I ate this bread I thought it would be wonderful to make for Christmas. My mom always made breads with fruit, nuts, and dates, so I guess this bread just brings back those memories. I loved the tartness of the cranberries and the crunch of the walnuts in the bread. This bread doesn’t have a ton of sugar in it as most quick breads do, so don’t be surprised that it is not as sweet as you may think. Another nice thing since it is a quick bread there are no worries of having to knead the bread or letting it set for hours while it is rising. I made mine in mini loaf pans so that I would have two loaves, one to share with my mom, but if you are making it in a 9×5 bread pan it will make one loaf. 1. Preheat oven to 350 degrees F. Grease two 7×3 1/2-inch or one 9×5-inch loaf pan. 2. Mix together flour, sugar, baking powder, salt, and baking soda in a medium bowl. 3. In another small bowl combine the orange juice, oil, orange peel, and the beaten egg. Pour this mixture into the dry ingredients and mix well. 4. Stir in the cranberries and nuts until well blended. Spread evenly in two mini or one loaf pan. 5. Bake for 45 minutes for the mini loaves or 55 minutes or the large loaf or until a toothpick inserted comes out clean. 6. Cool on rack for 15 minutes. Remove from pan; cool completely. 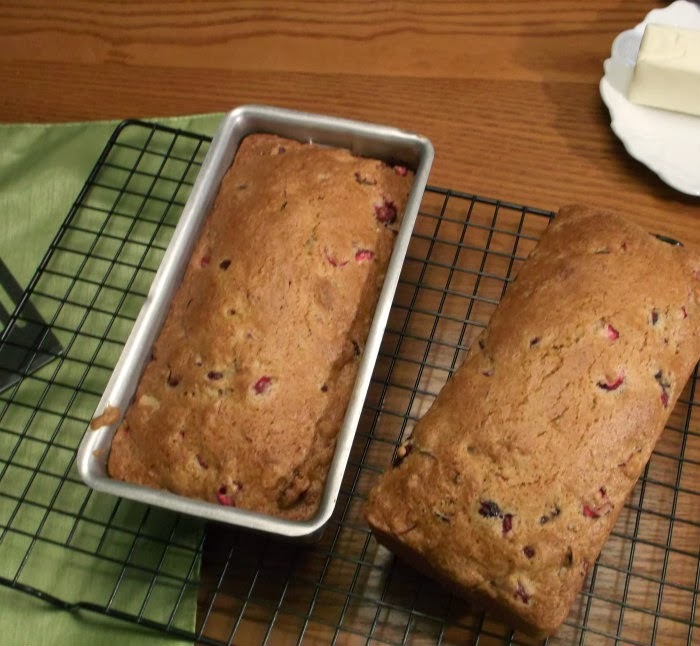 Cranberries add the perfect burst of sweet tart to quickbreads! yum! I always put a basket of quick breads and muffins on the table at Thanksgiving. What I love most about this bread is that it’s a quick bread but it’s not super sweet. I love fruits and nuts in bread! So you know I’ll like this. We’ve made cranberry bread before, but it’s been ages. Definitely time to do it again! Thanks.